B U B B L E G A R M: Outfit post with all the trimmings! Outfit post with all the trimmings! The outfit photographs didn't do the jacket justice so I have included a closeup. It has beautiful pleated puffy sleeves which tighten at the elbows. Here' a close up of the necklace which I made yesterday... I used a vintage Afghan pendant and combined it with colourful rustic beads. My makeup was plain and simple... A.K.A Boring! Face: A tiny bit of Bobbi Browns tinted moisturiser on my cheeks and chin area only. A light dusting of Bourjois gold bronzing powder all over my face. 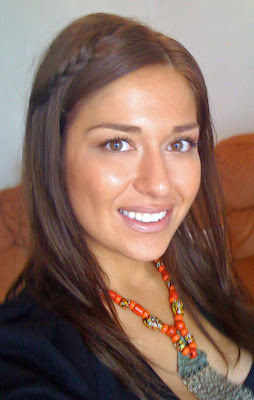 Cheeks: , Eyeko bronzing cream as blush. Benefit Moon Beam as highlight. Eyes: Benefit boing concealer under the eyes. Maybelline pulse perfection vibrating mascara on top lashes only. Benefit eye bright pencil on inner corners of my eyes. Lips: L'oreal Cappuccino lipliner with a pinky clear lipgloss. You look gorgeous! Love the outfit and your make-up. I can't believe you made that necklace, it's beautiful! You look lovely! Agreed on a close up of the boots! you look gorgeous. 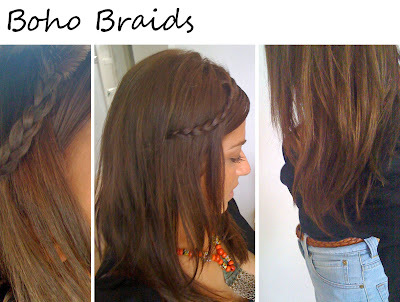 i love the boho braids and that purse is so very you indeed! Gorgeous necklace :) love the outfit too. Your makeup never looks boring..you skin is glowing. Loving the boots. I need to get some like that. I am in need of new shoes right now. Wow your skin looks amazing. Cute outfit too! You look gorgeous! I especially love the necklace and your hair, but your entire outfit looks great. it's so nice how you tucked your braid :) very sweet looking!